CARHS Automotive CAE Grand Challenge, April 12-13, 2016; Hanau, Germany. Look for us in the exhibit hall, Booth #22. Altair HyperWorks 14.0 Rollout Event, May 12, 2016; Troy, MI USA. Matereality’s Workgroup Material DatabasePro is available on the Altair Partner Alliance platform. SIMULIA Science in the Age of Experience, May 23-25, 2016; Boston, MA USA. Attend our presentation, " Using an Intermediate Validation Step to Increase CAE Confidence ." Look for us among the conference sponsors. NAFEMS Americas Conference, June 7-9, 2016; Seattle, WA USA. Attend our presentation, " A Design-Validation-Production Workflow for Aerospace Additive Manufacturing ." LS-DYNA International Users’ Conference, June 12-14, 2016; Dearborn, MI USA. Attend our presentation, " A Standardized Mechanism to Validate Crash Models for Ductile Plastics ." Look for us among the conference sponsors. DatapointLabs is proud to sponsor Ithaca High School's Code Red Robotics Team 639, whose performance in regional FIRST competition qualified them for the upcoming 2016 FIRST World Championships, as well as earning them the Engineering Inspiration Award. During matches, the Code Red Robotics robot was able to latch on to the bar positioned just over six feet off the ground, and pull the robot up quickly and consistently. See the robot in action during the finals! Final from Hamilton AV Inc on Vimeo. The Engineering Inspiration Award celebrates the team's efforts in advancing STEM in the community, teaching hundreds of people about how they can get involved with STEM, and working with their sponsors. The team collectively is projected to have over 2,300 hours of community service by the end of the year. Through their history, Code Red Robotics members have started over 25 FIRST teams for elementary school children, and 81% of the team's alumni in the past five years have majored in STEM fields in college. Congratulations to this year's Code Red Robotics team! DatapointLabs has acquired an Erichsen cupping apparatus for performing biaxial strain tests required to produce a Forming Limit Diagram (FLD). 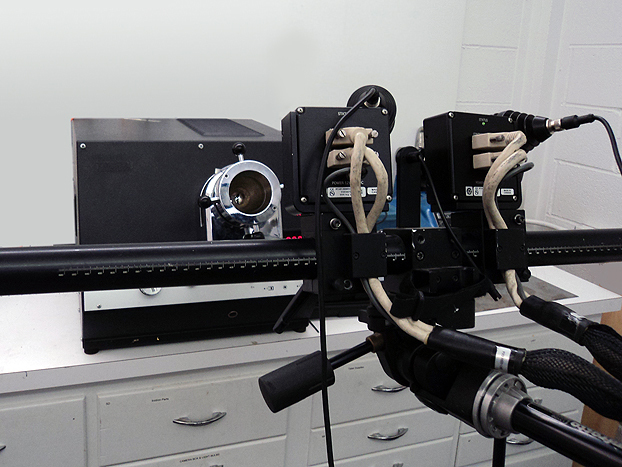 In combination with ARAMIS digital image correlation (DIC) techniques, the laboratory now can more accurately capture failure strains in bulge tests on sheet metals, in particular. View the complete Test Catalog online. The Matereality Workgroup Material DatabasePro provides a straightforward workflow for populating your database with data pertinent to your materials, and using that data inside Altair HyperWorks as part of your CAE simulations. We will showcase this complete workflow at the Altair HyperWorks 14.0 Rollout Event in Troy, MI, on May 12. Even if you can't attend the event, learn how Matereality’s Workgroup Material DatabasePro on Altair’s HyperWorks platform brings a hurdle-free interaction with materials information for design engineers by viewing this Matereality—HyperMesh Connectivity webinar recording, available on demand from Altair. 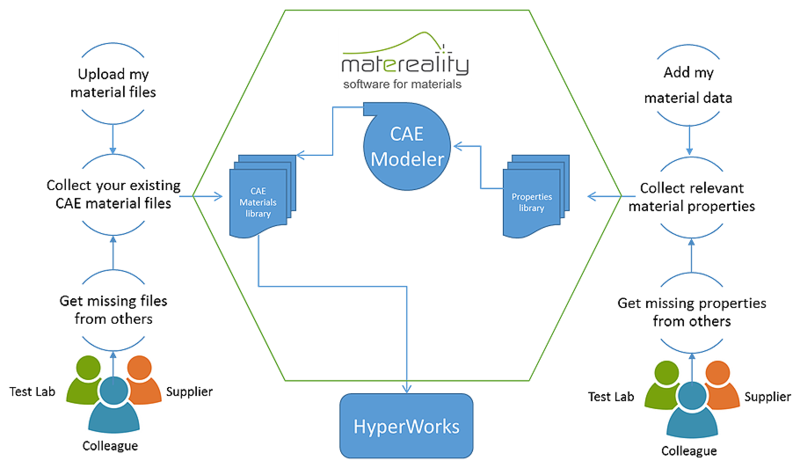 The connectivity with Altair products will soon be enhanced with the addition of Matereality's CAE Modeler for RADIOSS software, to be included in the upcoming Matereality v9.1 release. 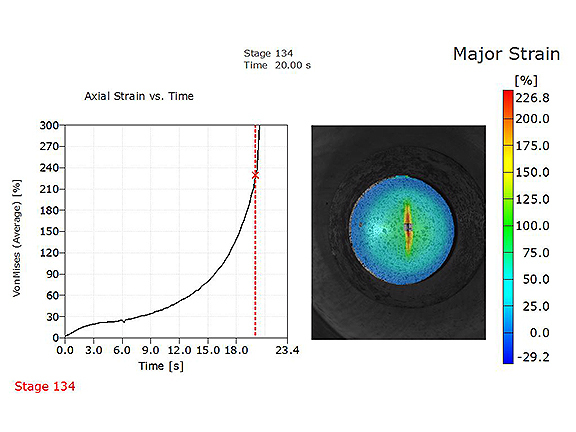 Altair RADIOSS is a leading structural analysis solver for highly non-linear problems under dynamic loadings. DatapointLabs already offersTestPaks for RADIOSS to support the material data requirements for these analyses. The new CAE Modeler for RADIOSS will make it possible to transform this data directly into formatted CAE material input files.